One in Eight - Owl Mountain Music, Inc.
One way to support and grow one's creativity is to support the creativity of others! 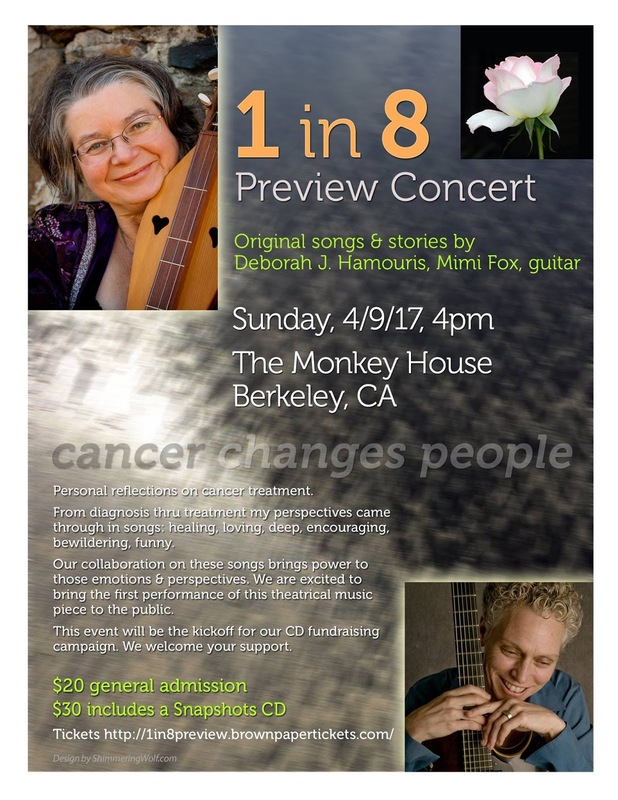 I have been blessed to play the role of support and cheerleader for my good friend, fellow dulcimer-player and teacher, one-time student and also a member of the cancer-survivor club, Deborah Hamouris. 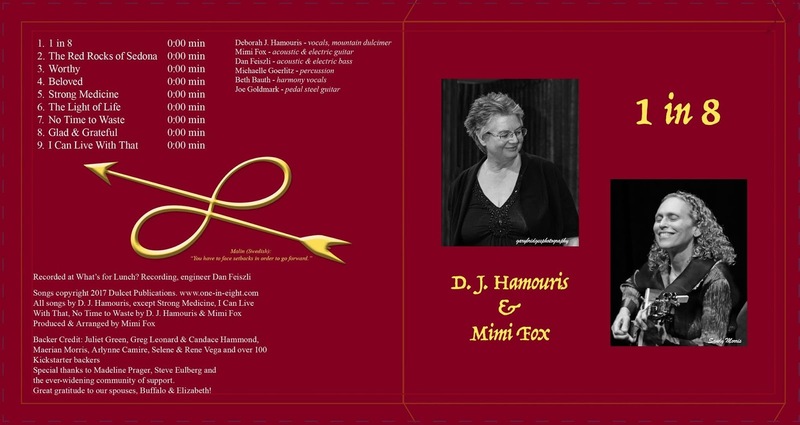 In response to her cancer diagnosis, she turned to creativity and wrote a musical stage show with her friend and collaborator, Mimi Fox. The show is called 1 in 8 which represents the number of women in the USA currently diagnosed with breast cancer. I was so tickled to see the debut performance of this show at the Monkey House in Berkeley last April with Mimi and the other supporting musicians. The show is the weaving together of these musical reflections on themes such as: Worthy, Strong Medicine, No Time to Waste, Glad and Grateful together with poetry and vibrant spoken reflections. While not shying away from the grit and fear of a cancer diagnosis, Deborah also gives full-throated laughter to the joy and surprise that comes as gift in the midst of recovery. A video archive of that performance was captured and I helped by editing it for scenes and selections that were a part of her successful Kickstarter Campaign this fall to fund the recording of the CD of the music. Deborah reports on Facebook that the recording is finished being mixed and it is GOOD! It will be released to the public in December! It is her (and my) hope that as a result of completing this recording, she'll be able to take the program around to wherever people are facing a new diagnosis, or are going through treatment, or are giving thanks for their years of survival, where caregivers are tired, in order show how a creative response brings about its own healing. If you would like to bring 1 in 8 to your community, contact Deborah through her facebook page above!